Do you feel like you're seated in the Heavenlies? Most of the time I don't! 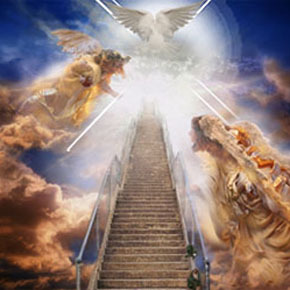 In fact, only on rare occasions when I'm in prayer do I feel like I'm soaring through heaven (metaphorically speaking). Yet God's Word is clear. God. . .raised us up together, and made us sit together in the heavenly places in Christ Jesus (Ephesians 2:6, NKJV). I'd feel safe, like nothing could ever harm me. I would no longer worry about anything, right? In heaven, there are no worries. I would lack for nothing. All my needs would be met. Sounds good, doesn't it? Truth is, I don't have to wait until I actually go to heaven to feel those things, to believe those things and to live those things. It's just a matter of taking God at His word and believe Him. How do you do that? Try reading Ephesians over and over until it sinks in! 10: For we are His workmanship, created in Christ Jesus for good works, which God prepared beforehand that we should walk in them. 11-12: according to the eternal purpose which He accomplished in Christ Jesus our Lord, in whom we have boldness and access with confidence through faith in Him. And this is just from three chapters of the Bible. Can you imagine the promises in the entire thing? We need to believe these blessings. We need to believe we are seated in the heavenlies with Christ! Not in an arrogant prideful way but in a humble, thankful way. As a child who's been adopted into the most powerful family ever known. It's a change of heart and a change of attitude that comes from faith. Stop cowering from the enemy. Stop living a defeated life. Take your seat in the heavenlies with Jesus and start living a life of victory! Love the pictures you shared on today's blog. It brings everything more to light. Now, as to the answer to your first question: "Do I feel like I'm seated in the Heavenlies ?" Key words being: "feel like" ... Well, if I went on feelings alone, then ... no, I don't feel like I am seated in the Heavenlies. Do I "know" that I am .... yes. Honestly, when the -- woes, cares, worries, concerns, problems, and distractions are finished here on Earth ... I for one, will be most delighted. But truly, I "need to" -- read and soak in Ephesians (like you recommended) until I not only 'know' it, but 'feel' it too ! Thank-you, again, for these great truths and reminders !!! I sure needed to hear them. Wow! Very inspiring and much needed. Thanks for the list of WE ARE reminders. Hugs! WOW! MaryLu I have been in church my entire life and have never heard a better sermon. It's almost too wonderful to think about...the things God has in store for his children. Thank you so much for posting this. Beautiful post, ML! I really needed to read this tonight. Love this. Hugs! Wonderful image but even better words. Love the reminders in the WE ARE list. Thank you!